Two innovation platforms (IPs) and two technology parks were launched recently in southern Mali. The IPs aim to facilitate knowledge sharing while the technology parks will provide infrastructure for farmers and agriculture students. The IPs and technology parks were established in Koutiala and Bougouni districts of Sikasso region. At the opening session of the IP meeting, Bougouna Sogoba, director of the Association Malienne d’Eveil au Développement Durable (AMEDD), said that IPs bring people together to enhance their knowledge and address their concerns through continuous interaction and mutual learning with the aim of influencing or changing perceptions, practices and public policies. Arouna Bayoko, technical manager, AMEDD, who moderated the meeting, spoke on the importance of periodic exchange meetings; pooling of diverse experiences and knowledge; exchange visits; sharing workshops; regular dialogue with policymakers to build strategic partnerships as well as capitalization of shares. Moussa Coulibaly, a farmer, said he had spent 42 years practicing market gardening but had noticed that educated youth dream of working in offices after graduation. ‘The technology park offers an opportunity to combine theory with practice and hopefully attract youth to the agricultural sector,’ he said. The IP sessions provided a forum for farmers who had benefited from the Africa Research in Sustainable Intensification for the Next Generation (Africa RISING) project to share their success stories. Dramane Samake, a farmer from Sikoroni, said many farmers from his village benefited from the improved practices and technologies they adopted. ‘We tested new dual-purpose varieties of cowpea and soybean which are also useful as fodder. I got a good harvest with the new varieties of okra. The delicious new variety of soybean – ‘soumbalashow’ is a success. Last year I was trained to process it and could taste and appreciate soybean sauce,’ he said. Samake hopes farmers will ‘find markets for our produce within the platform. In our village we do not have a market big enough to sell our products; we are looking for global buyers. With a big purchase, we can earn more money compared to retail buyers,’ he said. 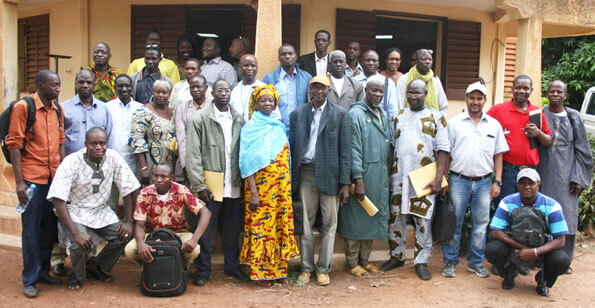 Participants at the Koutiala District Innovation Platform meeting (photo credit: ICRISAT /A Diama). Togola, Djeneba Mariko, president of the Doukafa Sabati Association (a women’s group), feels that the trainings will improve income generation activities among women and also educate them on various issues. ‘It is said that Sikasso region is the largest agricultural producer, but paradoxically, it is also the region where malnutrition is highest. Women and children suffer the most due to lack of information on preparing nutritious food. We need to find a good balance in the combination of foods we prepare and the role of women will be crucial,’ she said. At Koutiala the IP was launched on 19 May while in Bougouni it was launched on 21 May 2015. Meanwhile, technology parks were also launched. A technology park is a community-based experimental station consisting of a series of replicated and unreplicated experiments (mother trials). Determine farmer preferences for technologies. ‘We decided to establish technology parks both in Bougouni and Koutiala with the help of local NGOs AMEDD and MOBIUM. Two site coordinators were hired to monitor implemented activities in the technology parks. ICRISAT, ICRAF, AVRDC and Institut d’Economie Rurale, Mali, developed joint protocols to utilize the technology parks as areas to implement joint activities. Volunteer farmers are identified and offered training on different technologies and to implement agreed activities. ‘An example is the Ziziphus which produces big fruits that are rich in vitamins and nutrients. Also, we have tamarind, baobab and shea. We know that producers are not planting local species mainly because it takes a long time to produce; whereas in grafting those species, we reduce this time of juvenile growth. This may encourage producers to plant local species that are adapted to the soil and also provide nutritious elements that are not found elsewhere, says Dembele. This article was written by Agathe Diama and was originally published in ICRISAT Happenings. Tags: AMEDD, Bougouni, innovation platforms, Koutiala, MOBIUM, technology park. Bookmark the permalink.